The council said on its Twitter account on Monday that the results of 94.36 per cent of the 1,471,151 candidates that sat for the examination were released. Of that number, 923,486 candidates, representing 59.22 per cent, obtained minimum of number of credits in five subjects and above, including English Language and Mathematics. The examination started on February 20 and ended on May 15. The examination’s pass rate in 2016 stood at 52.97 per cent. According to the council, candidates who sat for the examination in 2017 will be able to check their results via waecdirect.org. 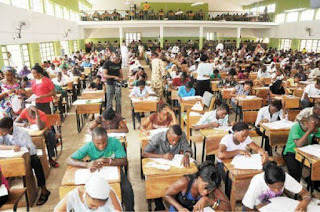 WAEC said 1,567,016 candidates registered for the examination, out of which 1,559,162 sat for it. “Out of the total number of candidates that sat for the exam, 1,471,151 representing 94.36% have their results fully processed and released”. It said 95,734 candidates representing 5.64% had a few of their subjects still being processed due to errors traceable to the candidates. “1,490,356 candidates representing 95.59% obtained credits and above in two subjects while 1,436,024 candidates representing 92.44% obtained credit and above in three subject,” WAEC said. WAEC also said 1,357,193 candidates representing 87.05% obtained credits and above in four subjects and 1,243,772 candidates representing 79.77% obtained credits and above in five subjects. “1,084,214 candidates, representing 69.54% obtained credits and above in six subjects”. “923,486 candidates, representing 59.22%, obtained minimum of credits in 5 subjects & above, including English Language & Mathematics”. The council said 214,952 candidates results representing 13.79% are being withheld in connection with various reported cases of exam malpractice. “The cases are being investigated & reports of the investigations will be presented to the NEC in due course for consideration. “The committee’s decisions will be communicated to the affected candidates through their schools,” the council said. WAEC assured candidates that the errors would be corrected and the results processed and released subsequently.